Actor/Director Hume Baugh (The Girl in the Picture Tries to Hang Up the Phone, Child Hood) wasn’t happy to see photographers while leaving this house on Toronto’s trendy Queen Street East. 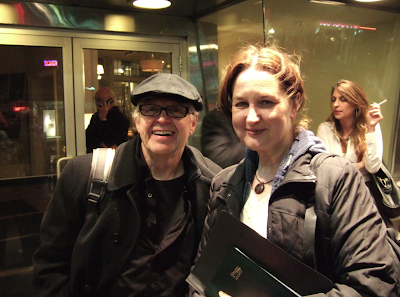 His production of All’s Well That Ends Well opens March 26, 2008 at Alchemy Theatre. 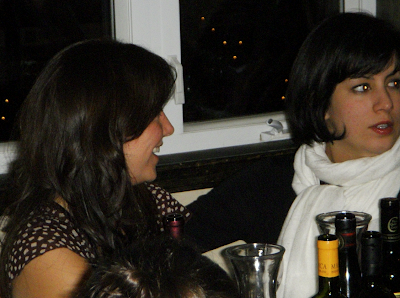 Elsa Perez (right), Artistic Director of the Théâtre Bilingue de Montreal (TBM), was seen out celebrating a friend’s birthday at the Trattoria Piatto Pieno in Montreal’s Little Italy. 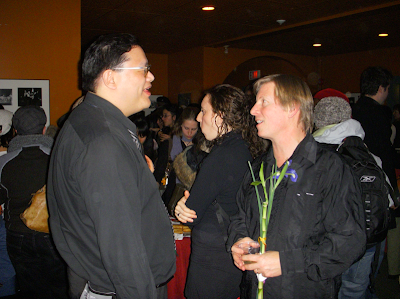 Celebrity fight director Joe Bostick (Dirty Dancing, A Nanking Winter) and Derrick Chua (left) co-producer of Studio 180’s Stuff Happens seen chatting it up and the opening night party of A Nanking Winter.